I was thinking of making my own kit but if they make a kit for a REASONABLE price I my go that route... Anyone? Last edited by 97Beater4WD; 02-21-2012 at 10:15 AM. It's tough to do DIY without it looking cheap. But some have done it. Definitely functional, just not as clean as the one you pictured. As long as the angle up the A pillar is the same as the Blazer and the length from the hole in the fender to the first bend in the snorkel is the same - I don't see a problem. 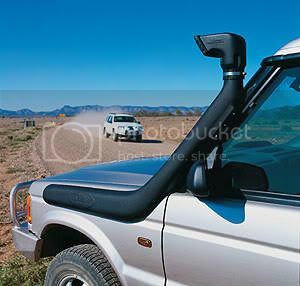 If you make one, I would recommend taking it out the top of the hood so you can have two separate hoods, one for offroading that has the snorkel and one that you use for street use. Just go to a junk yard and grab one. You could also do the same thing for with the body panel, but thats a little harder to swap, but still not to bad. As for the hood...Nah... gunna go out the side the fender with a safari piece that sits firm (with bolts) against the side...I also have a plastic welder so if I have to cut and fab I can do that too..
A guy on the ZR2 site used a SS105HF snorkel on his Blazer. The plastic actual snorkel works but from the fender to the air box he had to figure it out on his own. Quick Reply: Snorkel? Any one have one?